Since opening in 2004, making us the longest established Agency in Northamptonshire, we are incredibly proud to have built a reputation as a trusted, reliable, friendly and extremely professional agency. In 2015 we opened offices in both Surrey and Hertfordshire. Surrey is looked after by Victoria Saxby NNEB and Hertfordshire by Paula Dolan NNEB. 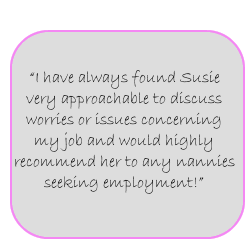 Both were very much like myself and have many years of Childcare experience and truly understand what is required for an agency to provide the level of service required by both Nannies and Families. After successful periods both have now gone on to pursue other interests and we are currently looking for the right replacement for the Surrey branch. In Feb 2018, after interviewing many prospective partners, we are delighted that Heather Wooderson has agreed to run our Hertfordshire branch and, following a successful initial few months has also established The Nanny Company in Essex. 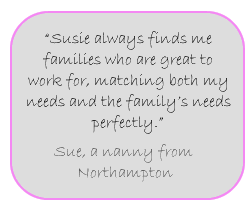 We are committed to providing a truly bespoke service to both Nannies and Families believing that everyone is unique and has individual requirements. Therefore, although we can provide you with a live in or out Nanny, a Mothers' Help, Babysitter, Emergency Cover or an Event Child Carer we also know that sometimes what you need is not quite as straightforward! Whatever it is you are looking for, we can help. We pride ourselves on getting to know you as a Family or an individual which helps us to ensure we only make truly successful placements. We take great pride in the fact that over half of our jobs come from recommendations and word of mouth. We have placed many high profile jobs with families in the public eye where discretion and confidentiality is paramount. 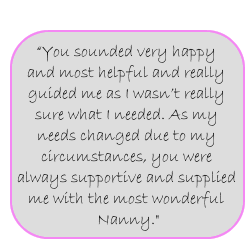 Have a browse through our testimonials to see what some of our clients and Nannies have had to say about us over the years. 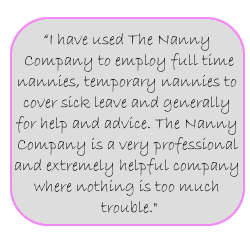 We have links with many local councils and authorities and have assisted in advising and placing Nannies on their behalf. We are also pleased to have a fantastic relationship with Northampton College and visit them regularly to give lectures to students taking Childcare qualifications. We work in partnership, and have built excellent relationships, with many local Hotels including Rushton Hall, Fawsley Hall, Sedgebrook Hall & Whittlebury Hall. So if you are attending or indeed organising a wedding or other event we can cater for your Childcare needs at the venue, advising you of recommended ratios, arranging interviews and liaising with the venue. We have undertaken many of these assignments and can provide references and testimonials on request. Although we hope you find our website informative we would much rather chat to you in person so please call us any time.